While doors are opening to people with disabilities, traditional approaches to accommodations can fall short when it comes to creating true engagement. The report by The Coaches Training Institute outlines a new approach to improve that engagement. 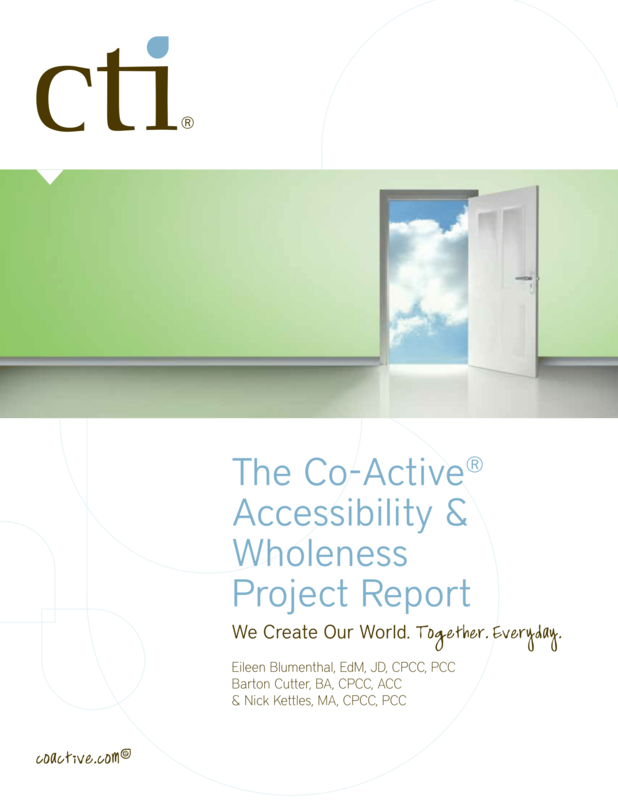 CTI's Co-Active Accessibility and Wholeness Project (CAWP) Report provides new perspectives on designing accommodations that meet the accessibility challenges of an individual. While doors are opening to people with disabilities, traditional approaches to accommodations can fall short when it comes to creating true engagement. That’s among the main findings from the “Co-Active Accessibility and Wholeness Project” (CAWP) Report released by The Coaching Training Institute (CTI). To provide tangible examples of how CTI’s Co-Active Accessibility and Wholeness Project has served coach training students of all abilities. “The report summarizes the initial findings of work to bring accessibility and inclusion to the field of coaching and leadership development,” explains Barton Cutter, Accessibility Consultant for CTI and who has Cerebral Palsy himself. John Vercelli, CTI’s Co-President comments: “CTI holds that each person is naturally creative, resourceful and whole, and, that everyone is a leader. To further communicate the message of the report, Cutter and his colleague Eileen Blumenthal, Co-Director of Coach Training at CTI, will make a presentation entitled: “Creating Mutual Inclusivity: the Art of Making Coach Training Accessible to Students with Unique Abilities,” at the Association of Coach Training Organization’s (ACTO) 2017 international conference, June 8-10, in Toronto, Ontario, Canada. CTI® (also known as The Coaches Training Institute ®), is the largest in-person coach training school in the world. With more than 50,000 people from more than 100 countries, trained worldwide, including employees of upwards of half the Fortune 500, CTI's transformative learning programs successfully demonstrate coaching as a core leadership competency. The book, Co-active Coaching, is the most popular book on coaching, often used by other coach training programs too, and is now in its third edition. With 100,000 copies sold, it’s been published in more than 10 languages worldwide.